So I think to play with other the signal should match - use the following to remember which is which. Im writing this really for myself so I can refer back to it but you may find it useful also. Mismatch will cause either too-weak signal or distortion. So John what about Instrument level - oh brother where art thou? I'll have to research that too but sweetwater has it defined as no set level and usually weak but depends on the instrument whether it has active element (battery or added oomph) or passive on the signal or whether is purely electromechanical in nature and so weaker signal. External Preamp and gain for the duet. "What is line level? –10dBV and +4dBu demystified"
This was included on a previous internal stickie note - its useful so I'll include for our education. 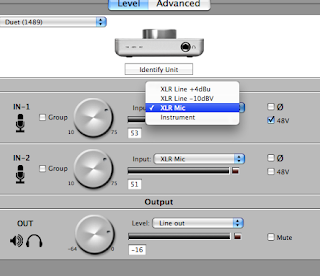 +4 dBu is "professional" line level, common in modern pro recording gear, and it is about 1.25 V.
0 dBv is an average line level, typical output from rackmount guitar/bass preamps. 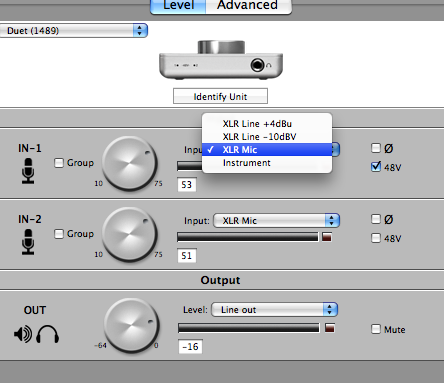 -10 dBu is "consumer" line level, common with older and cheaper recording gear. -20 dBu is roughly in the neighborhood of a typical instrument's output. -30 dBu is again in the neighborhood of a typical microphone's output.